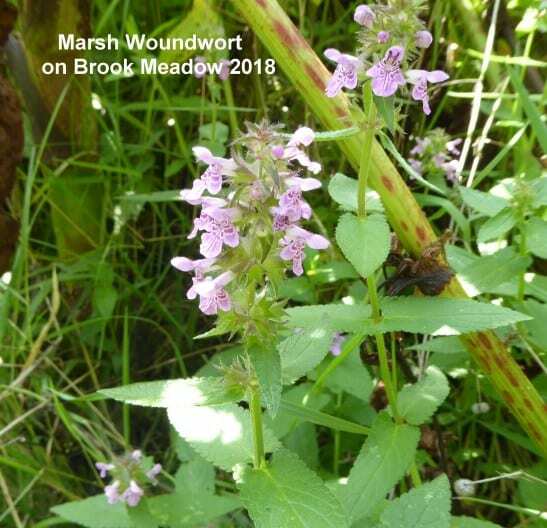 This presentation is basically a celebration of the excellent variety of wildlife that live in or visit Brook Meadow – a testament to the volunteers who work so diligently to protect, conserve and improve the habitat. Wildlife records in 2018 were generally a bit lower than usual – mainly due to absence of Malcolm Phillips and less watching from me. We urgently need more wildlife watchers to maintain the records. 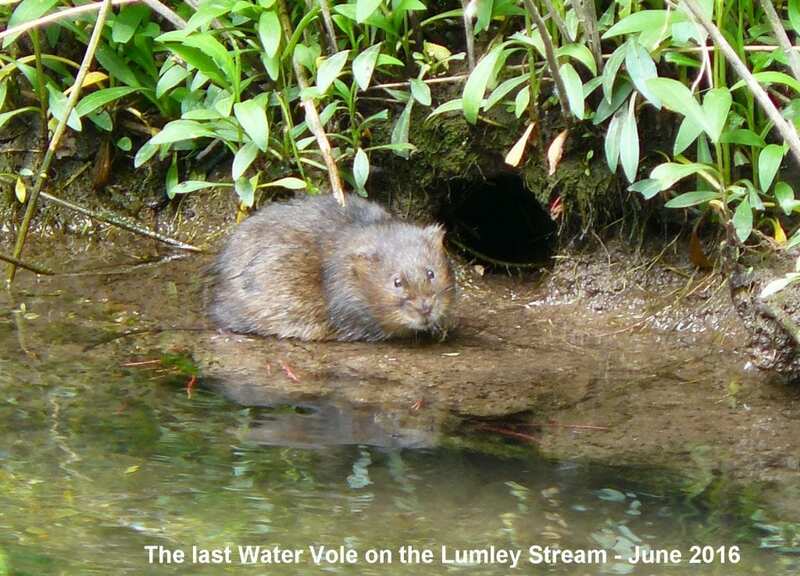 There has been no sightings of Water Vole since June 2016. This was our last sighting – and photo! 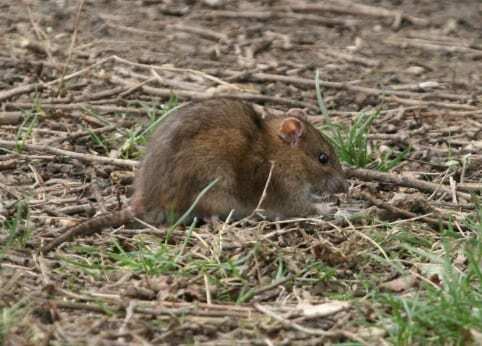 I get occasional reports from around Palmer’s Road Copse, but they are almost certainly of Brown Rat. There is a large hole in the east bank on Palmer’s Road Copse visible from the path which I am monitoring, but looks too large for a Water Vole burrow and is probably a rat hole. 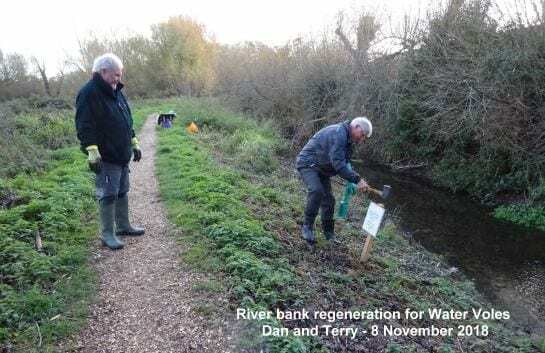 Dan Mortimer has a plan to regenerate the river bank habitat for Water Voles and has made a start by planting Common Reed rhizomes near the north bridge. A small step in the right direction. Moles are always present, showing themselves by mounds of sifted soil at the head of their tunnels. I have received no reports this past year of Fox, Deer, Rabbit, Weasel, Harvest Mouse, Shrew though they have all been seen on the meadow in the past. 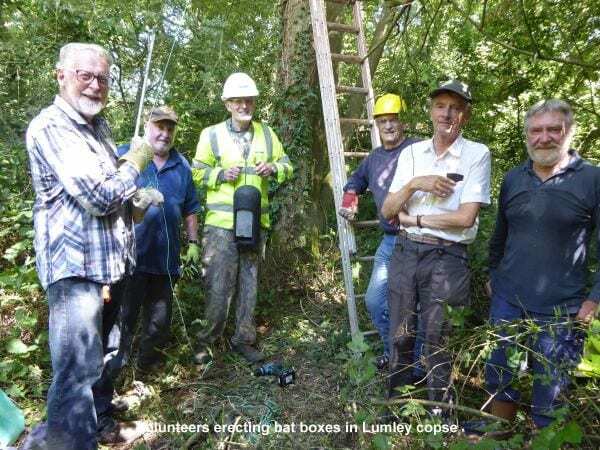 Six bat boxes were installed in Lumley copse on July 23 by 5 volunteers led by David Search. Two types of bat boxes were installed close together on the same tree. One is a woodcrete bat box with two entrances, one at the rear against the tree trunk and one at the front. Bats often creep in by the rear entrance and leave by the front. The other is a maternity roost box with plenty of space inside for young bats to roost in. I think Nik Knight will be checking them – he has the appropriate licence to do this. 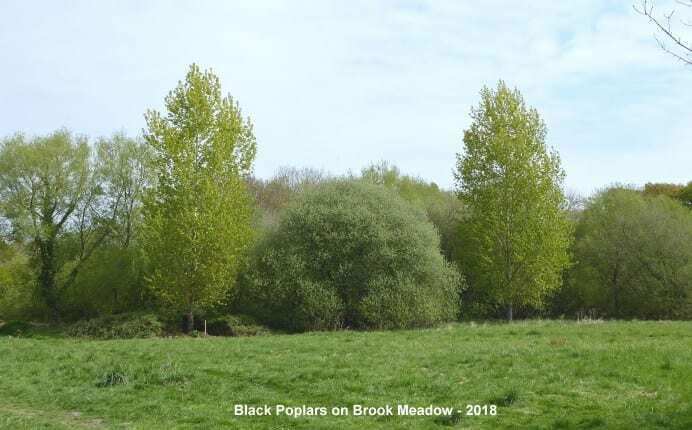 I logged 49 species of bird on Brook Meadow which is about the annual average. 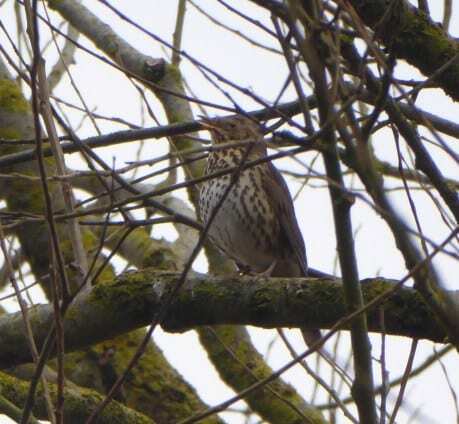 All the resident birds were present and singing well, including at least two Song Thrushes in spring. 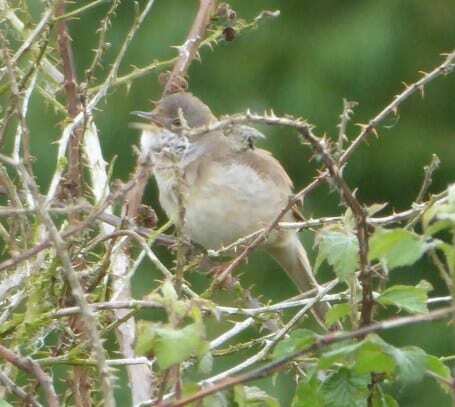 All 3 summer visitors arrived – Chiffchaff, Blackcap and Whitethroat; 3 Whitethroat were singing in early May. 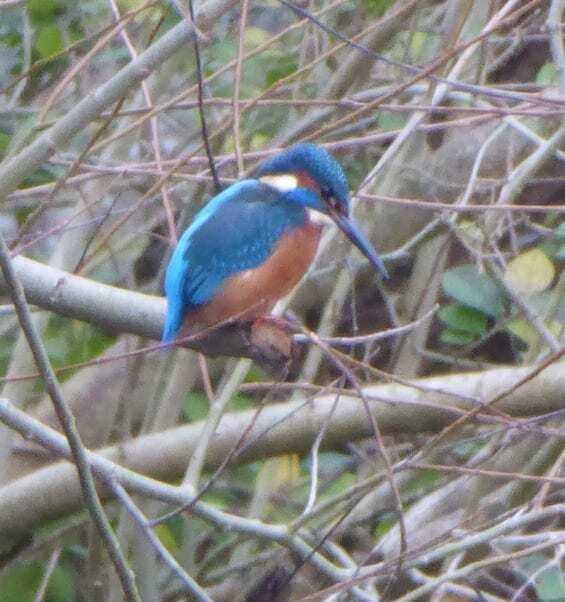 Kingfisher has been seen occasionally in autumn/winter. 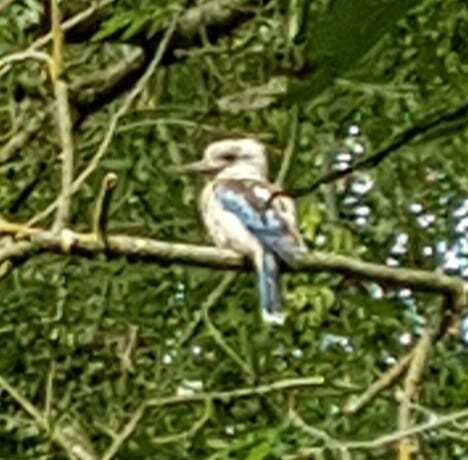 I managed to get a photo of one near the north bridge. Water Rail has been a regular winter visitor to the river for several years, but there has been just one sighting this year – in March on the edge of the flooded south east corner of the south meadow. I only managed to record 16 butterfly species this year which is my lowest ever annual total. Maybe the butterfly transect will boost numbers? Missing were Small Tortoiseshell (for the first time ever), Painted Lady, Clouded Yellow, Small Copper, Small Heath and Ringlet. 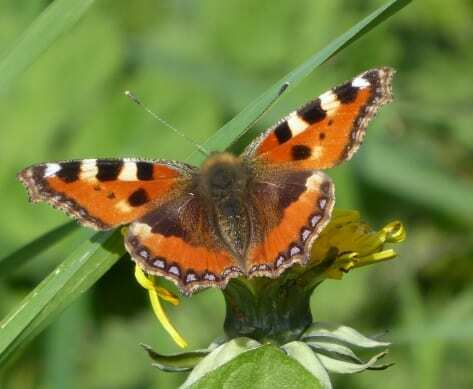 The results of the nation wide Big Butterfly Count also showed dramatic declines in Small Tortoiseshell (lowest count ever), Red Admiral (down -73% on 2017), Comma (-40%), Gatekeeper (-54%), Meadow Brown (-56%), Ringlet (-62%) and Marbled White (-70%). 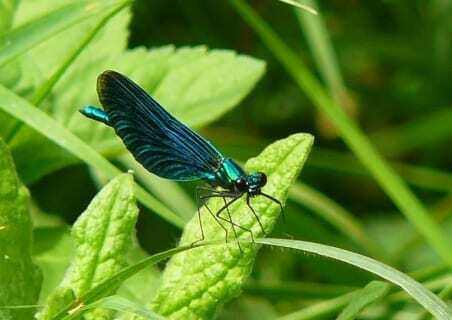 I had very few sightings of Banded Demoiselle which used to be the most common of the two demoiselles. Common Darters were the most common dragonfly, particularly around the bridges where they perch. Southern Hawker was also seen frequently flying low. Hoverflies, Honey Bees, Bumblebees and Wasps were widespread. 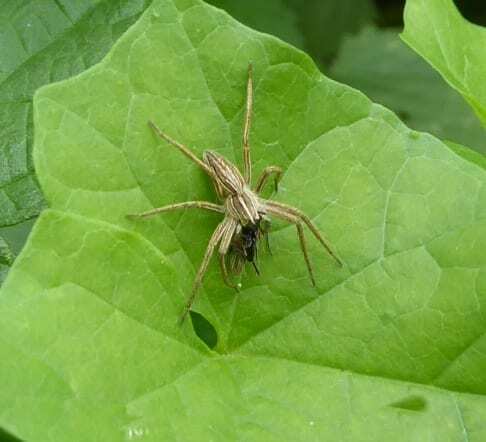 Nursery-web spiders were abundant on the meadow, resting on leaves with forelegs stretching out or guarding nursery web nests of spiderlings. Mike Wells got photos of Brown Trout and Pike – the only sighting of this predator this year. Not good news for Water Vole recovery. Herbs – 127 species recorded – slightly down on the average. Missing regulars were Broad-leaved Everlasting-pea, Goat’s-beard, Hoary Cress, Marsh Arrowgrass, Marsh-marigold, Water Dock. 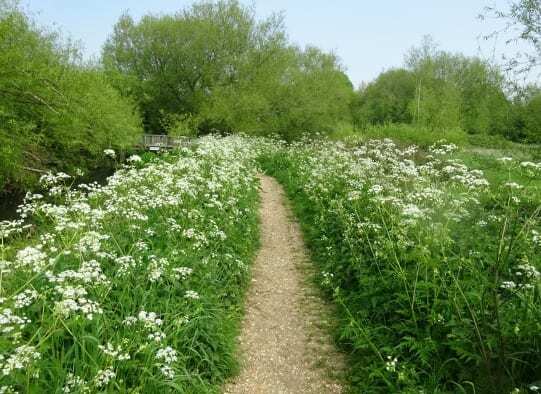 Cow Parsley created an avenue of aromatic lace on the main river path in early spring. Butterbur flowering spike count was steady at 604 – most plants are below the seat. 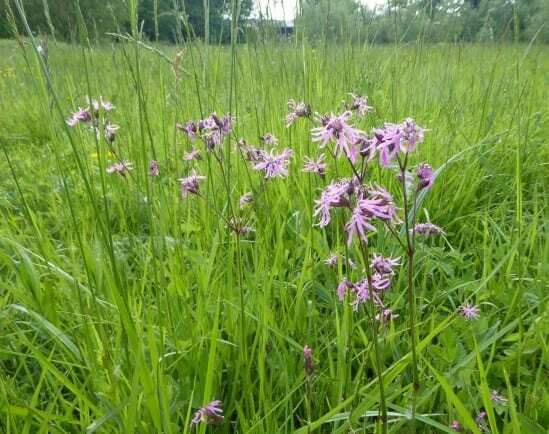 Ragged Robin had its 2nd best ever count of 433 flowering plants. 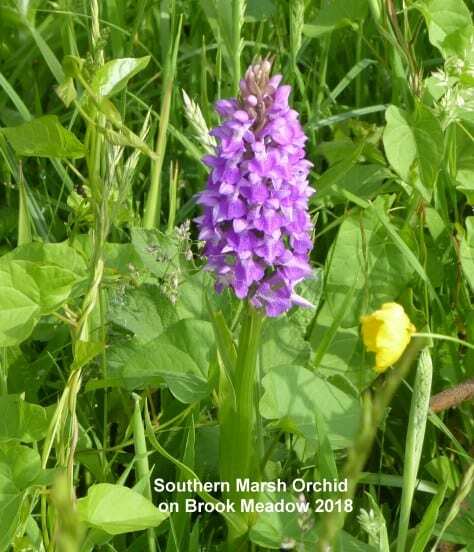 Orchids had a bumper year with record numbers for Southern Marsh Orchid and Common Spotted Orchid. Bee Orchid numbers were down due mainly to the problem in finding them in the long grasses. One Pyramidal Orchid was unexpected – the first on Brook Meadow since 2010. I hope it remains for next year. There was a good crop of Great Burnet with about 20 plants on the southern part of the orchid area all covered with multiple flower heads. They were first discovered in 2013 and confirmed by Martin Rand and now appear to be well established. Trees – 56 species present (I think, as I have not checked them all). 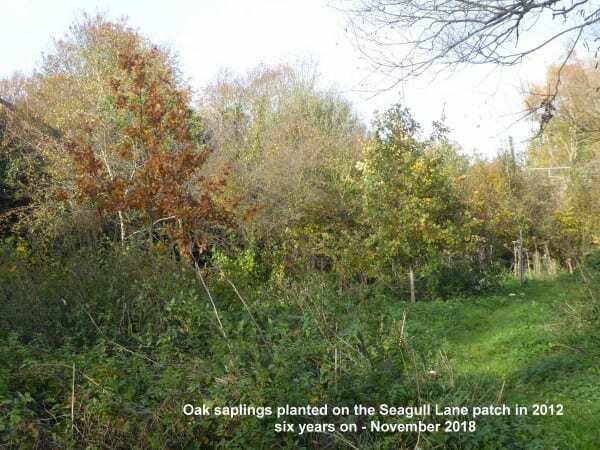 The planted Oaks on Seagull Lane patch are all doing well. There has been an exceptional crop of Acorns. 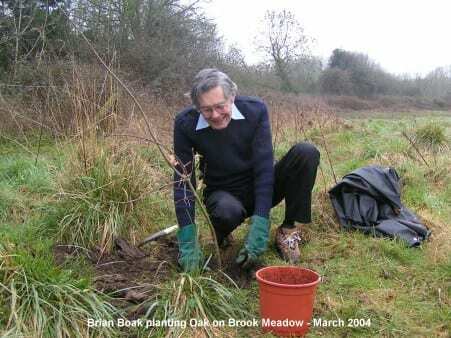 Talking about planting Oaks I discovered a photo in my files from March 2004 of one-time member Brian Boak planting one on the west side of the north meadow which has grown very well. Brian also planted the Weeping Willow at the north end of the south meadow. There has been a great crop of red Rowan berries on the Gwynne Johnson plantation on the east side of the north meadow. The group’s intention to cut a path around the back of the trees should open up this magnificent plantation. The two Black Poplars planted in 2004 on the edge of Lumley copse dominate the view from the causeway. The Aspen tree planted in Dec 2005 by the Haskins family is now a magnificent tree and its leaves shiver golden in the wind. There are two other Aspens (self seeded?) on the edge of the copse behind the Rowan plantation. 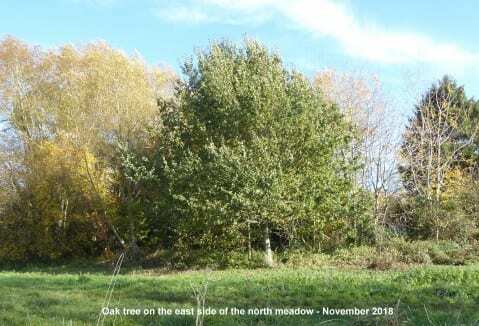 An Alder sapling was discovered during a workday in October, self-seeded from the tree in the edge of the Lumley Stream. The newly laid hedgerow on the west edge of the Seagull Lane patch in February is now growing well and provides a good habitat for birds and other wildlife. I had a close look at some of the Ash trees that we have on the meadow for signs of Ash die-back disease. The very large Ash on the railway embankment which overhangs the north path looks a little sad with no leaves and rather wizened seed cases. One of the younger self seeded Ash saplings on the north path also looks unhealthy with dead crinkled up leaves. Grasses – 23 species. Missing regulars were Soft Brome, Smooth Brome, Giant Fescue and Meadow Barley. 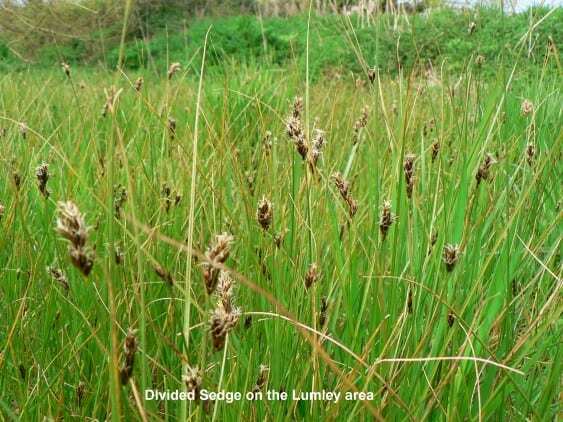 Sedges – 14 species with an excellent crop of Divided Sedge on the Lumley area – thanks to the management of this area by the conservation group . Fungi – I don’t normally record fungi, but in May I spotted a magnificent cluster of Dryad’s Saddle growing on the trunks of an old Crack Willow tree on the west bank of the river between the sluice and the S-bend. The large caps are flat-topped and saddle-shaped, named after dryads or wood nymphs in Greek mythology. The upper side of the caps is tan-yellow with concentric bands of dark brown flat scales which look like spots. Its season is spring to summer, but unlike many other bracket fungi it does not persist. Reptiles – Only Slow-worms were reported no Lizards. In July reptile mats were out across the meadow with a view to the relocation of Slow-worms and Common Lizards onto the meadow from a building development in Warsash. 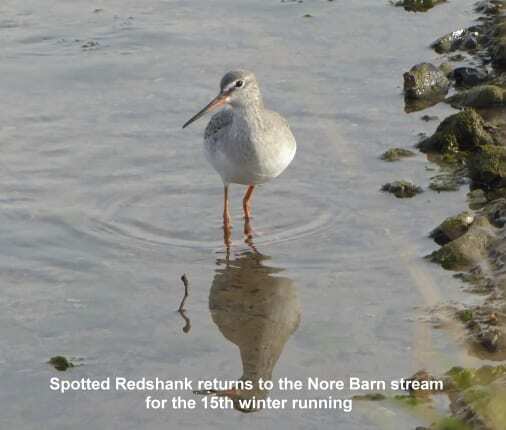 Spotted Redshank – Finally, I have to report with great joy that the famous Spotted Redshank has returned to Nore Barn for the 15th year running.